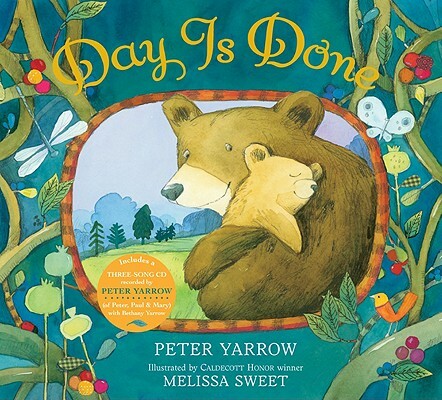 Peter Yarrow follows the blockbuster success of Puff, the Magic Dragon with a picture book version of his beautiful song, "Day Is Done." As night falls, animal and human parents everywhere tenderly tuck their children into bed. In the darkness, each child--raccoon, doe, rabbit, field mouse, and a little boy--wonders: Will I be safe? Will you be there for me? And every mommy and daddy responds with the comforting words of Yarrow's refrain: "I am here." Caldecott Honor-winning artist Melissa Sweet has created gorgeous images that celebrate the loving bond between parent and child, as well as the connection between all creatures of the earth. Peter Yarrow is a member of the iconic '60's folk trio Peter, Paul & Mary. Along with Lenny Lipton, he is the author of the beloved song and now hit book Puff, the Magic Dragon. In addition to extensive touring and performing, Peter is active in Operation Respect, an organization that promotes anti-bullying awareness in schools across the country. Melissa Sweet has illustrated more than 40 children's books, including the 2008 Caldecott Honor winner A River of Words, which was also listed as a New York Times Top Ten Children's Book of the Year. The New York Times Book Review listed Carmine: A Little More Red (Houghton Mifflin, 2005)--which she both wrote and illustrated--among its Ten Best Illustrated Books of the Year, and The Boy Who Drew Birds (Houghton Mifflin, 2004) was a New York Public Library Best Book for 2004.